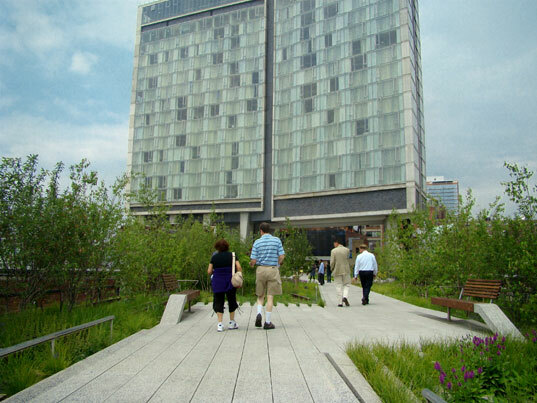 New York’s High Line Park in the Sky Opens Today! 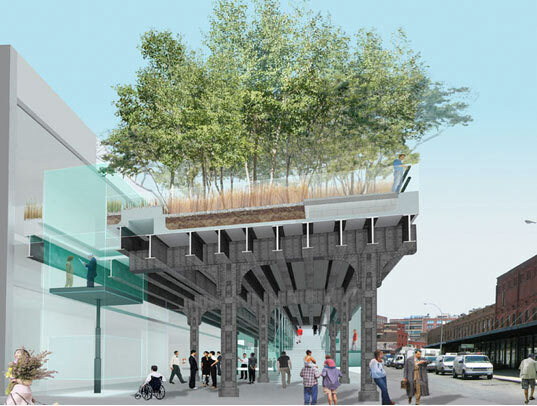 An elevated park in the sky built on top of the skeleton of an old rail system? It may have sounded impossible only five years ago, but today, the eagerly awaited High Line elevated urban park officially opens for thousands of New Yorkers looking to escape the hubbub of the city below! 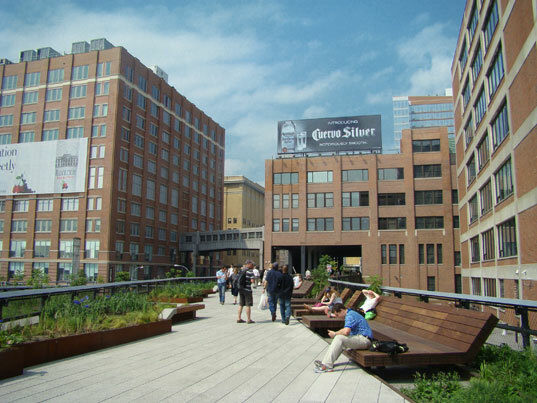 Here at Inhabitat, we have been following the journey of the High Line for the past several years and were super excited to get a sneak peek yesterday of the new park, which was renovated / designed by James Corner Field Operations, Lead Designer, with starchitects Diller Scofidio + Renfro. 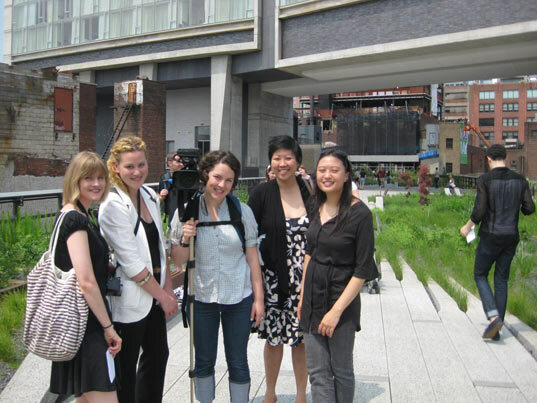 We were thrilled to get a chance to scope out the High Line yesterday as we’ve been waiting for this for ages! ), so check out our pics below! The High Line was originally constructed in Manhattan’s Meatpacking District in the 1930s to lift dangerous freight trains off of city streets. 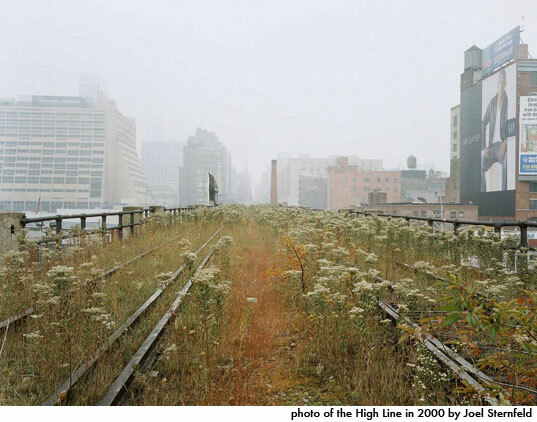 Abandoned in the 1980’s the High Line went into decay and disrepair and was rediscovered in popular consciousness in 2000, after acclaimed photographer Joel Sternfeld captured the beauty of the industrial relic in photos: overgrown with wildflowers — an abandoned human structure essentially reclaimed by nature in a matter of 20 years. 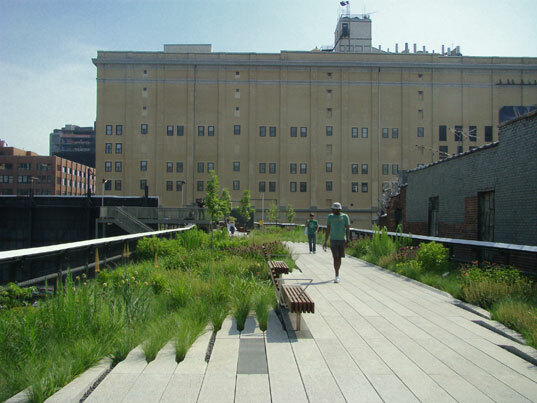 The City of New York was originally planning to tear down the High Line, but a group formed, called ‘Friends of the High Line’, to protect, preserve, and renovate the High Line. 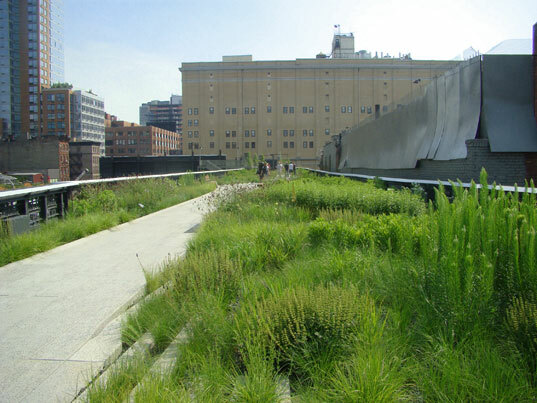 This eventually lead to a design competition, and the commissioning of landscape architects James Corner Field Operations and architects Diller Scodifio + Renfro to rehabilitate this abandoned space into a lush, green, elevated paradise for Manhattanites. Renovations spanned a time frame of several years (with another section yet to be complete until 2010), but visitors to the park yesterday all seemed to agree that it was well worth the wait. So what was our verdict? Well, while we view slick renderings of concepts for urban green spaces almost everyday, it is an entirely different thing to actually step into a completed project and see it with our own eyes. We weren’t sure if it was going to be possible for a starchitect-designed renovation to maintain the simple, stark beauty of the original, overgrown High Line – the one that had captured the imagination of so many Manhattanites in 2000. But we were impressed and pleasantly surprised! The feeling at the High Line today was one of excitement, optimism and pride that our city was able to take something that was just a gleam in our eyes a few years ago and turn it into something that we, and hopefully generations to come, can enjoy. 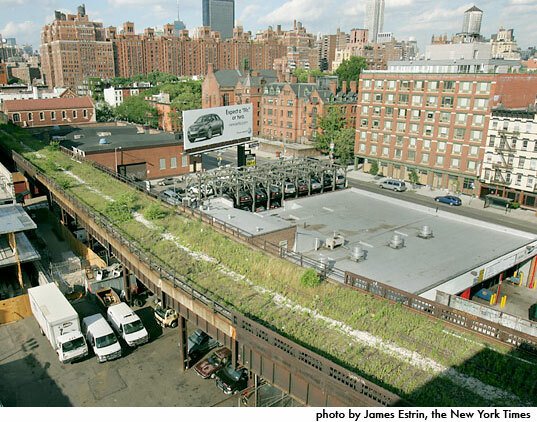 For New Yorkers like myself, who are just witnessing the beginnings of an urban space revolution, the High Line is a tangible manifestation of what the future could look like. That being said, you’re probably wondering what it looked like. The most prominent features of the long and winding park are the preserved rail tracks that poke out through the porous layer of concrete that has been cut away in strips here and there emphasizing a linear aesthetic. Lush shrubbery, reedy grasses and watercolor-hued flowers surround the rust-red tracks in a way that seems deliberate yet natural. Farther down along the meandering pathway, sunbathers relaxed on blocky wooden chaise lounges, some of which have casters that look like they can roll right along the tracks (although they can’t, we tried). Vistas that were unseen to most New Yorkers, like a view of the clubs in the Meatpacking district from above and peeks into the posh lofts that are at the same level as the High Line were visible, for the very first time, from here. Inhabitat editors Jill Fehrenbacher and Olivia Chen were able to speak with several of the key players in the project, including James Corner (Design Lead, the landscape architect) and Ricardo Scofidio (the architect) and we will be bringing you these interviews shortly. Stay tuned for our upcoming video and interviews! 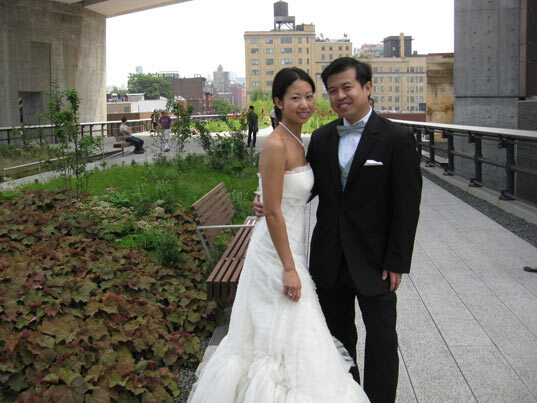 Finally, congratulations to this lovely couple who celebrated their wedding day at the opening day of the High Line. What a beautiful and symbolic way to commemorate their special day! Soon we'll have such ideas in Providence,Hartford,& New Haven! Alright arhligt alright that's exactly what I needed! why is Piet Oudolf not mentioned in this article? He designed the planting, how can you not mention that? This is not a new idea - Paris, France as put together such a park on abandoned rail lines over a decade ago (which is when I lived there - not sure how long it was there before me). A great way to re-use the space! In Paris, the raised park has lighting, and the space below is populated with shops and restaurants. Recycle and re-use! Great article. There is a nice video of the Highline Park by an NYU film student (and my son) available at http://austindill.net for those who want to feel themselves moving through these pictures on an equally bright, breezy day. I just came back from NY and although I had researched this project a while back I didn't know I was about to accidentally walk right into this urban oasis just a couple days after its opening. I'm an architect born and raised in a major metropolis (Sao Paulo, Brazil) and I have always been devastated by the horrendous urban footprint created by suspended freeways in the city below. But after experiencing the high line park in NY, my heart has been filled with joy and HOPE once again! The space that opens more space, a different elevation, a different perspective; new corners and surprises are revealed, the city that will morph and grow around this park is absolutely fantastic. May this be an example of future urban intervention. Keep what is, transform what was and let the living city around tell you what it will be. 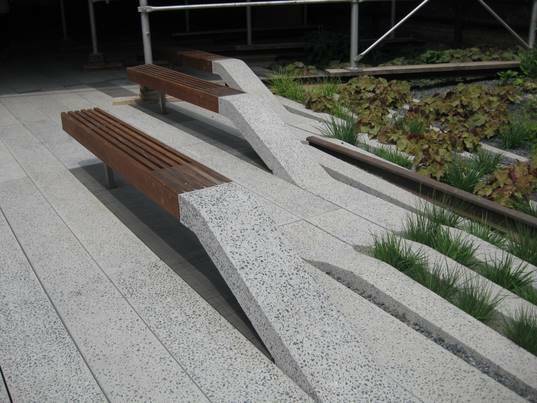 I’ve got some more pictures of The High Line Park at my flickr. http://www.flickr.com/photos/franparente/ Very nice project! What a beautiful park in the middle of Manhattan. I hear the views from their are spectacular! To make it even better - it is self-supporting. More parks like this one please. It's wonderful that someone thought of this park in the sky. I love this! Maybe there's hope for humanity's junk pile, yet. Anything Piet Oudolf, responsible for choice and position of the plants does, I am in favor of.Where in this article is he mentioned? I read rather poorly. If we could not have the wild garden, I'm sure this is the next best thing. An interesting project. I agree that some of the before pictures had a great impact, although the new planting is very well done between the floor structure. The best part is being able to walk around the city at a height that you are not used to and being able to see things from a new perspective. Offering praise for the effort to reclaim this urban oasis. Some observations: i almost prefer the way it looked in 2000, less manicured and designed (but accessing the space was probably more dangerous), there seems to be no lighting, calling into question the safety of this place after dark, and its not wide enough to play frizbee or play catch (just for jogging/strolling). Otherwise, a nice place to get above it all. 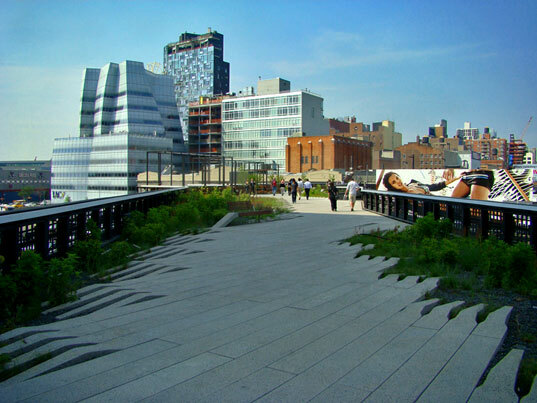 New York's High Line Park in the Sky Opens Today! High Line - looking exactly like we had hoped and imagined!